After gaining 83 points in the previous session, the Indian Equity Markets saw consolidation happening in the Friday’s trade. The Markets opened lower and after testing lows of the day by afternoon, the benchmark NIFTY50 saw remarkable recovery in the second half of the trade. The benchmark Index recouped nearly all of its losses and ended the day flat losing just 0.70 points or 0.01%. The session saw some good amount of shorts also being added as the NIFTY June futures saw discount widening further by 26-odd points. We expect a modestly positive opening to the trade but in the same breath, also expect some resistance coming in the 10820-10850 zones which is likely to prevent any immediate runaway up move in the NIFTY. As we step into the fresh week, Monday will see the levels of 10820 and 10850 acting as important resistance area for the Markets. Supports come in at 10710 and 10630 zones. The Relative Strength Index – RSI on the Daily Chart is 58.3016 and it remains neutral showing no divergence against the price. Daily MACD has turned bullish and it currently trades above its signal line. Apart from a white body, no significant formations were observed on Candles. If we look at pattern analysis, we see that a fresh trend line resistance is being developed on the Daily Charts. This line marks the highest point of NIFTY at 11171 and then subsequently joins two other lower tops. In the immediate short term, the zone of 10820-10850 works out as the pattern area resistance given this formation. Overall, though there are no triggers for any outright negativity in the Markets. 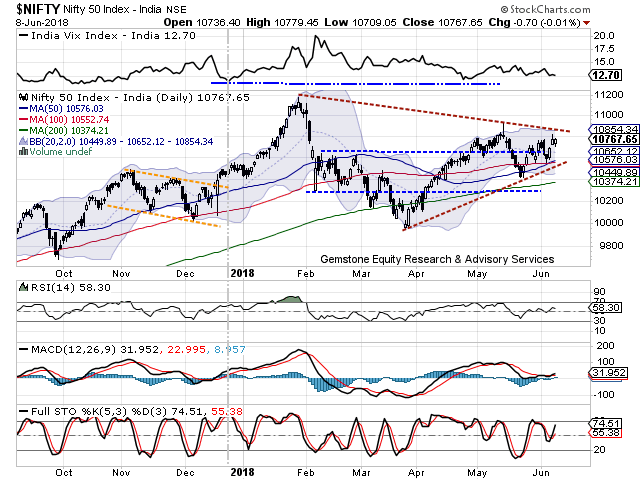 The global scenario remains stable and we may see NIFTY advancing its gains. 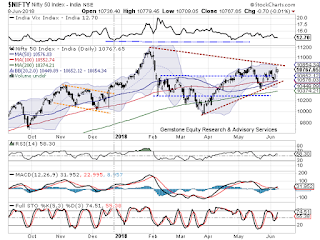 However, it would become imperative to become cautious near the 10820-10850 zones as NIFTY may again develop some formidable resistance in this area. Only a meaningful breach of the 10820-10850 zones on the upside would mean resumption of up move for NIFTY. Unless this happens, NIFTY will remain susceptible to corrective actions from higher levels. While maintaining highly stock and sector specific view on the Markets, fresh purchases may be made while guarding profits at higher levels. Long positions were seen being added in JP ASSOCIAT, SAIL, BANK OF BARODA, CG POWER, PNB, RELIANCE SUZLON, SUN PHARMA, STATE BANK OF INDIA, TATA MOTORS, TV18 BROADCAST and INDRAPRASTHA GAS.